Visit Surfers Paradise and take a whale-watching cruise on the Pacific during this day trip from Brisbane. You’ll start with the cruise on board a custom-built boat for spotting marine life. Glide along the Nerang River canals, and then look for humpback whales at play during their annual pilgrimage to the coast of Australia. Before the return drive to Brisbane, you’ll have a little free time to explore Surfers Paradise. Your day trip starts as you depart Brisbane for the drive south to Surfers Paradise, where you’ll hop aboard your purpose-built whale-watching boat. While you cruise along the canals of the Nerang River, listen to a few safety instructions from crewmembers, who will point out luxurious homes along the scenic Gold Coast waterway. Cruise past South Stradbroke Island and into the Australian Whale Sanctuary, a protected piece of the ocean surrounding Australia that’s part of the annual migration of humpback whales, who make their way to these subtropical Pacific waters to give birth every May to October. 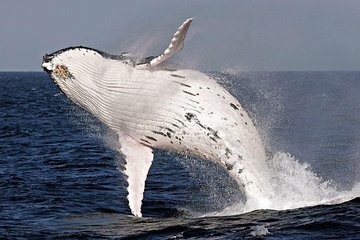 Keep your eyes peeled for the whales, who may show off with jumps and splashes, as well as other marine life such as loggerhead turtles, orcas, dolphins and seabirds. Learn about the wildlife and their marine environment from your onboard naturalist guide, and then return to shore for up to 2 hours of free time in Surfers Paradise, where you can shop in the boutiques or hang out on the beach before making the return drive to Brisbane. This tour was well organized and conducted in a proficient manner. We appreciated the extra time in Surfers and the actual whale watching was excellent. We recommend this activity. An amazing adventure. We saw 8 whales 3 of them youngsters. The cruise was great and informative and roomy enough for everyone to have a great view. Well organised trip. Staff friendly and informative. Saw lots of whales. Well worth doing. It was overall good experience, except a cancellation made by your side. The tour was great! Got to see multiple whales! The snacks provided onboard the ferry was just average. Hopefully, more improvements will be made with regards to the snacks provided. Cruise was great but organization was poor. The boat holds 320 people and there were long lines and not enough seating. Get in line early. The buffet had chicken, pasta, salad and bread. The food was above average but not very creative. The welcome drink was either a champagne punch or a Becks. Nice trip... wish I had seen more of the whales rather than just the hump and tail. Outstanding crew extremely knowledgeable. Saw many whales, as promised. More time at Surfer's Paradise would be great we only had 50 minutes there.